Pregnant? 4 Natural Therapies You Should Be Using To Help Ease Your Pregnancy Pains! Finding out you are pregnant is a joyous and overwhelmingly excited event. However, the realization that your body is no longer just your body soon sets in and can provoke a fear like no other. Knowing that everything you consume, put on and do to your body may affect that little person growing inside of you, can become beyond stressful. Mothers-to-be will often choose to suffer with pain because of not knowing what is harmful and what is not. The worry of taking any medication for pain becomes too much so they choose the “better safe than sorry” approach as opposed to taking action to combat their aching back, head or legs. Good news Mommas! There are very safe alternative methods to help you overcome those pregnancy pains without the conventional methods of overused medication for pain! In order to understand why different approaches to pain relief for pregnancy work, it is best to understand why the pain begins in the first place! The following is a little information on how the changes in your body from pregnancy affect the pain that you feel. Why is my head pounding? With pregnancy comes headaches. At some point along that 40 week pregnancy journey, you will have a headache. Women who have never had headaches will get them, and women who suffer from them will feel as though their headaches are more severe and more frequent. So, what’s the deal with headaches? During the first trimester of pregnancy your hormones surge and go crazy! This along with a huge increase in the volume of your blood will cause headaches to come on out of nowhere. However, it’s not just the hormones and blood. As your belly grows, your posture becomes harder to maintain and becomes far from perfect. The bigger the belly, the more your low back is pushed forward. This results in compromises all the way up your spine into your neck and head. Your shoulders roll forward and your neck straightens to compensate for you low back. These postural changes can cause the bones in the neck to not articulate as they should. This is known as a misalignment of the spine. These postural changes and spinal misalignments will bring on headaches quickly due to the compromising of the nerves that run out of your cervical spinal column into your neck and head. Why do I feel like I can’t breathe? Oh those hormones! Believe it or not, hormones can make you feel as though you are short of breath. Progesterone is a key hormone that increases when you are pregnant. Progesterone causes you to breathe in more deeply and makes you feel like you are not taking in enough air. Hormones are not the only culprit taking your breath away. As your baby grows, so does your uterus. Your uterus is located below the muscles of the lungs known as the diaphragm. The larger the uterus, the more pressure being put on the diaphragm, the harder it is to breathe. During the third trimester, your baby maybe the actual cause of feeling like you cannot breath. Depending on how the baby is positioned, he or she may actually be kicking you in your ribs! Kicking is not the only issue with these little mobile guys, even stretching out underneath your ribs or moving by your ribs can cause pain or a misalignment of the ribs. Your ribs serve to protect the vital organs of your body such as the heart and lungs. When the ribs are misaligned or not in their proper place, breathing in will cause severe pain due to the misarticulation of the bones, stretching of the muscles and compromising of the nerve function. Why does my back constantly ache? Ahhh, the backache like no other. It seems to only get worse as you progress through pregnancy. Why does this happen? Early onset of back pain in pregnancy can be because of those fun hormones we’ve been talking about. From the second you become pregnant, your body goes into stellar “getting ready for birth” mode. Your body releases hormones that allow for the ligaments holding your bones together to loosen. This, along with some bloating and cramping that can occur in early pregnancy, can make for a killer backache. As your pregnancy continues and your baby gets bigger, your weight increases. A typical pregnancy weight can can be from 25-35 lbs. The majority of this weight goes right to your belly, forcing your pelvis to widen and your lumbar spine to sway inward toward the baby. This forces the rest of your spine to change accordingly and alter your posture. Misalignments of the pelvis and lumbar spine occur due to the pulling of muscles and ligaments and because of the altered posture, putting pressure on the discs, muscles, and nerves in the low back, producing a constant low back pain! Why are my legs on fire? That sharp, aching, burning feeling in your legs. Almost every pregnant woman will have this pain at some point during her pregnancy. What is it? The answer maybe not one you would expect because it is mostly associated with an injury to a bulging or herniated disc. But the answer is a simple one. It’s sciatica. Sciatic pain is that deep, dull, aching, burning pain you can feel in your hips, thighs, buttocks, legs and feet. It can be in one area or travel down from your buttocks to your feet leaving no region unaffected. Sciatica is caused when the sciatic nerve becomes compressed or irritated. This nerve is the longest nerve of the body and travels from your lumbar spine down through the buttocks, to the back of the thigh and down through the back of the leg into the foot, on both sides. During pregnancy, sciatic pain comes on because of the changes in your lumbar spine, pelvis and posture. Your anatomy shifts and it is common that the sciatic nerve gets compressed during the growing belly process. Alright, so know you know why the pain is happening. What can you do about it, naturally? 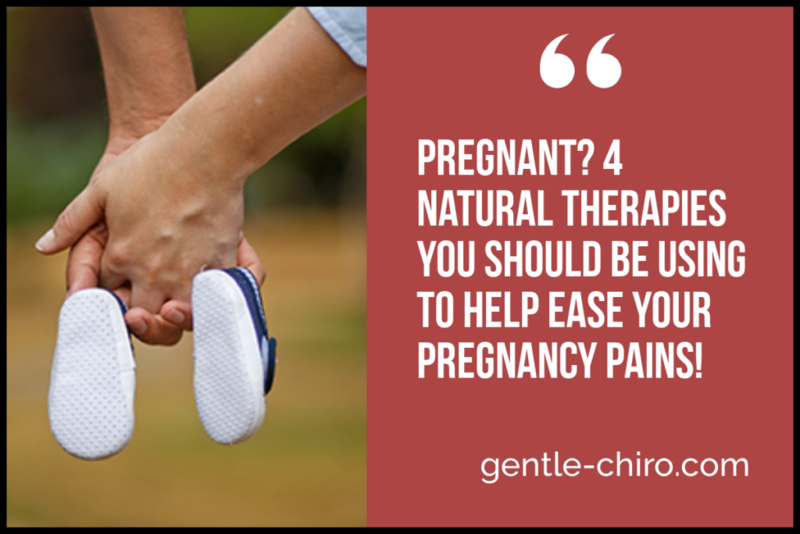 Now that you have a better understanding of why the changes in your pregnant body are causing you pain, let’s talk about what you can do naturally to ease the pain. The following list contains several alternative, natural methods to help ease the aches and pains that come along with that growing baby bump! With these natural therapies, techniques and alternative care treatments, the fear of doing something that could be potentially harmful to your baby should be eliminated. Okay, so we aren’t talking about training for a marathon here. We are talking safe moderate amounts of exercise. During pregnancy, moderate exercise will help with keeping your posture correct, relieve stress and help with maintaining a good pregnancy weight gain. Exercise causes the body to release endorphins. Endorphins are peptide hormones that act as your body’s natural pain killers. They bind to receptors in your brain and act to diminish the perception of pain your body feels. Endorphins bind to the same receptors that pain medications bind to, but since they are produced in the body naturally, they are 100% safe and non-addictive! Endorphins from exercise will help headaches, low back pain and sciatic pain. Exercising on a regular basis will also build muscle tone and strength which will help maintain your spinal and rib alignment, allowing for easier breathing, as well as help prepare your body for the birthing process! Massage therapy is a natural method that helps to reduce muscle tension and stress, relieve headaches, backaches and leg pain, and it promotes good circulation and overall wellness throughout the body. Massage is a manipulation of the muscles, tendons, ligaments and connective tissues of the body to reduce tension in the soft tissues of the body and to promote blood flow and ease stress. As with exercise, endorphins are released during massages and act as a natural pain reliever. There are many different techniques used in massage therapy, but during pregnancy it is recommended to stick with a prenatal massage. Prenatal massage is a massage technique aimed at combating the muscle tension in your neck and back associated with pregnancy. Prenatal massage increases circulation and mobility, decreases stress, muscle tension and soreness. Massage therapy is an all natural method that is safe after the first trimester of pregnancy and proven effective in the alleviating of headaches, backaches and sciatic pain. Acupuncture is an ancient Chinese method of alternative medicine that consists of using needles to stimulate specific pressure points on the body to alleviate pain. Acupressure is based on the same theories and principles as acupuncture, but involves only the use of the hands as opposed to needles to stimulate the pressure points of the body. Acupuncture and acupressure techniques are natural techniques based on eliminating blockages of the body that inhibit the balancing of energy that flows throughout the body. These interferences cause the body to not function properly and cause pain. Both have been deemed safe after the first trimester of pregnancy and have been utilized to treat a range of pregnancy symptoms from morning sickness to inducing labor. Headaches, backaches and sciatic pain as well as easier breathing have been associated with the use of acupuncture and acupressure throughout pregnancy. Chiropractic is the treatment of vertebral subluxation that is the direct result of misalignments in the spine and joints of the body. These misalignments affects the muscles, ligaments, tendons, and nerves of the body causing pain and dysfunction. Chiropractic care is an all natural method, that is safe for pregnancy and works to keep your body healthy and functioning at its optimal degree. As your baby belly grows, the weight causes pressure on your lower back, hips and pelvis. This pressure causes your posture to alter and causes misalignments to occur throughout the body from the back to the neck. Chiropractic adjustments gently remove the misalignments, or subluxations, of the spine and joints to allow the bones to articulate properly, thereby eliminating stress on the tendons, ligaments, muscles and nerves of the body. The benefits of chiropractic and pregnancy go well beyond the reduction of headaches, backaches, sciatic and rib pain. Chiropractic can help with nausea, positioning of the baby, and easing of labor and birthing pains. As always, with any type of therapy or alternative care, it is best to consult with your primary care doctor to ensure you have no complicating factors or contraindications. With the techniques and therapies listed above, all have been determined to be safe and effective. Your body is amazing. Having the ability to grow another being inside you is nothing short of a miracle. Your body has everything it needs to allow for the conception, growth and birth of your tiny human. Sometimes, your body just needs a little help with eliminating interferences that cause pain. By using natural methods to eliminate these interferences, you are allowing the body to heal itself. You just need to utilize your body’s potential by giving it the tools it needs to do its job!